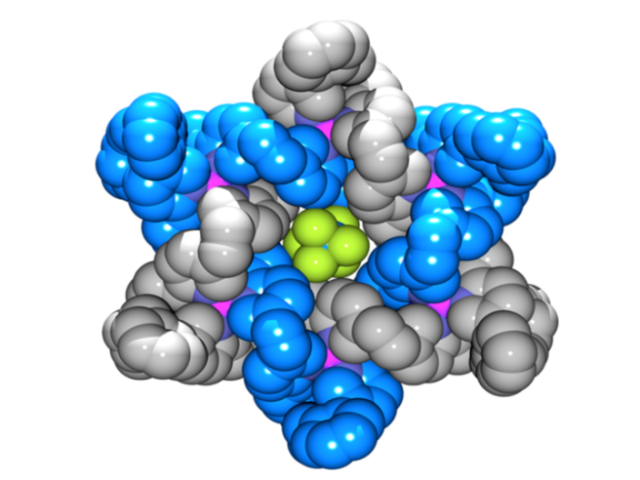 ‘A Star of David Catenane’ David A. Leigh, Robin G. Pritchard and Alexander J. Stephens, Nature Chem, 6, 978–982 (2014). Full Article. News & Views. Video. The Star of David topology, or 6-2-1 link, is an iconic symbol whose use in historical, religious, and cultural contexts stretches back to the dawn of human history (Figure 1). It is a fundamental element of structure (like the trefoil and pentafoil knots and Borromean rings) and as such has been an explicit, but until now unrealized, target of synthetic chemistry for a quarter of a century. 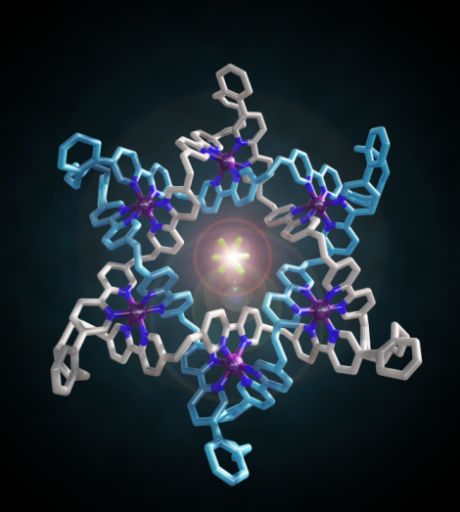 Now chemists at the University of Manchester have described the first Star of David molecular link (a triply interlocked catenane). The woven scaffold is a circular hexameric helicate generated by the assembly of six tris(bipyridine) ligands with six Fe2+ cations, the size of the helicate dictated by the use of sulfate anions. The structure of a carefully chosen ligand extension directs subsequent capture of the molecular architecture by ring closing olefin metathesis. Confirmation of the Star of David topology and structure—two triply-entwined 114-membered rings—is provided by various methods, including X-ray crystallography (Figure 2). Extraction of the iron(II) ions with Na4EDTA affords the wholly organic triply-entwined molecular link. Figure 1. Starry, starry night. [‘A Star of David Catenane’ David A. Leigh, Robin G. Pritchard and Alexander J. Stephens, Nature Chem, published online 21 Sept 2014]. Image credit: H. Adam Steinberg (www.artforscience.com). Figure 2. Make me a star! The chemical formula and X-ray crystal structure of two triply entwined 114-membered rings, a molecular 6-2-1 link, featuring iron ions (shown in purple), nitrogen atoms (dark blue), carbon atoms (one ring shown in orange/white; the other in light blue) and a single PF6-ion (green and orange) at the centre of the structure. 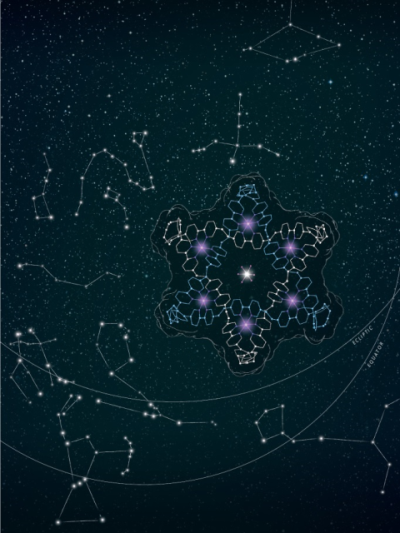 [‘A Star of David Catenane’ David A. Leigh, Robin G. Pritchard and Alexander J. Stephens, Nature Chem, published online 21 Sept 2014]. Image credit: Robert W. McGregor (www.mcgregorfineart.com) and Alex Stephens. For a fly-around movie of the X-ray crystal structure click here. 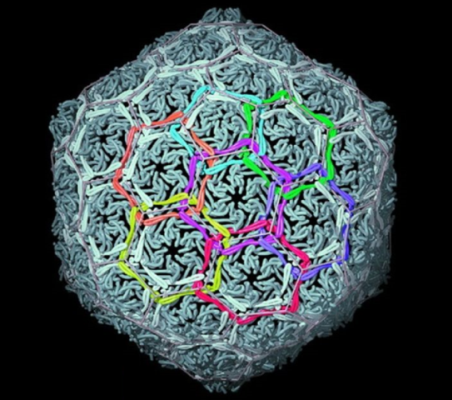 Biology shows that topological complexity at the molecular level offers tremendous potential for achieving novel material properties: Nature links protein rings to make the ‘chainmail’ that forms the shells of certain viruses (Figure 3). Linking and entwining man-made molecular rings may lead to new generations of materials that are strong but light and flexible, benefits reminiscent of the advantages of chainmail over suits of armour in the middle ages. Figure 3. Natural molecular chainmail. The X-ray crystal structure of the interlocked protein shell of a virus. [W. R. Wikoff, L. Liljas, R. L. Duda, H. Tsuruta, R. W. Hendrix, J. E. Johnson. Topologically Linked Protein Rings in the Bacteriophage HK97 Capsid. Science 289, 2129-2133 (2000)]. Although the Star of David has been used by numerous religions and cultures over the last two millennia (e.g. Figure 4; see www.star-of-david.blogspot.co.uk for many other examples), it is nowadays generally recognised as the symbol of Judaism and features on the national flag of the State of Israel. Figure 4. Moroccan 4 Falus Coin (1873/4). Chaim Weizmann (1874-1952) was a Reader (roughly equivalent to the modern day position of Associate Professor) in the Chemistry Department at the University of Manchester from 1904-1916 (Figure 5). During this time Weizmann pioneered the field of biotechnology, using microorganisms to convert the starch in maize to acetone and butyl alcohol, chemicals that were in critically short supply in Britain during WWI. After leaving Manchester and a 15 year break from science, Weizmann returned to biotechnology research, running a laboratory first in Holborn, London, and then, from 1934, at the Daniel Sieff Institute in Rehovot, Palestine. The Daniel Sieff Institute was established by, and named after the son of, one of the founders of the ‘Marks and Spencer’ retail empire in the UK. It formed the nucleus of what in 1949 became the Weizmann Institute of Science, with Chaim Weizmann as the first director. In the same year Weizmann became the first President of Israel. Figure 5. 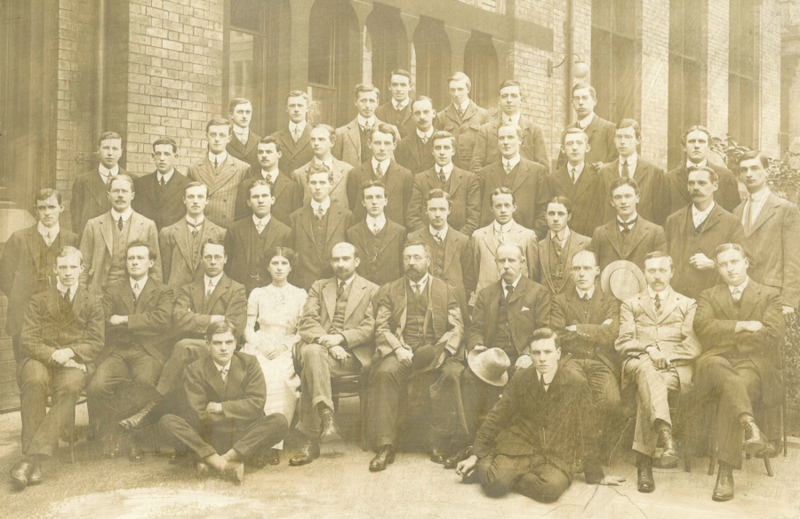 Members of the Chemistry Department, University of Manchester, 1911. Chaim Weizmann (front row, 5th from left); other notable persons seated on the same row include William Henry Perkin Jnr (6th from left) and Robert Robinson (Nobel Prize 1947; furthest left). The realization of the Star of David in molecular form by University of Manchester chemists is dedicated, in recognition of his scientific legacy, to the memory of Chaim Weizmann (1874-1952), Reader in Chemistry at the University of Manchester (1904-1916) and the first President of Israel (1949-1952). G. S. Oegema, The History of the Shield of David: the Birth of a Symbol (Peter Lang Publishing Inc., 1996). C. Dietrich-Buchecker, J.-P. Sauvage. A Synthetic Molecular Trefoil Knot. Angew. Chem. Int. Ed. 28, 189-192 (1989). J.-F. Ayme, J. E. Beves, D. A. Leigh, R. T. McBurney, K. Rissanen, D. Schultz. A Synthetic Molecular Pentafoil Knot. Nature Chem. 4, 15-20 (2012). K. S. Chichak, S. J. Cantrill, A. R. Pease, S.-H. Chiu, G. W. V. Cave, J. L. Atwood, J. F. Stoddart. Molecular Borromean rings. Science 304, 1308-1312 (2004). J.-P. Sauvage. Interlacing Molecular Threads on Transition Metals: Catenands, Catenates, and Knots. Acc. Chem. Res. 23, 319–327 (1990). D. A. Leigh, R. G. Pritchard, A. J. Stephens. A Star of David Catenane. Nature Chem., published online 21 Sept 2014. B. Hasenknopf, J.-M. Lehn, N. Boumediene, A. Dupont-Gervais, A. Van Dorsselaer, B. Kneisel, D. Fenske. 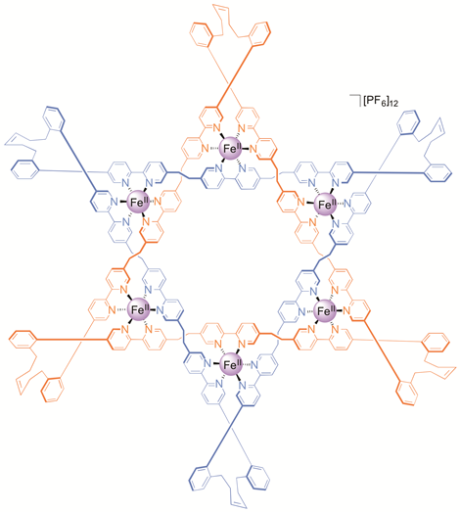 Self-Assembly of Tetra- and Hexanuclear Circular Helicates. J. Am. Chem. Soc. 119, 10956-10962 (1997). W. R. Wikoff, L. Liljas, R. L. Duda, H. Tsuruta, R. W. Hendrix, J. E. Johnson. Topologically Linked Protein Rings in the Bacteriophage HK97 Capsid. Science 289, 2129-2133 (2000). A. R. Michaelis. Chaim Weizmann: His Living Memorial – The Institute Bearing His Name. Anglo-Israel Association. 1974.